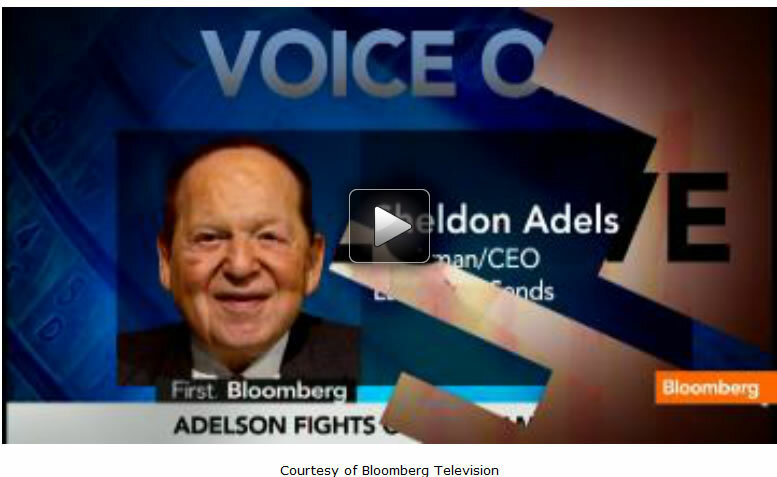 Las Vegas Sands Corp., Chairman and CEO Sheldon Adelson joined Bloomberg TV's Deirdre Bolton on "Money Moves" today to discuss why he's come out swinging against online gambling and said: "I think it is a train wreck. It's really toxicity. It is a cancer waiting to happen." Adelson on poker being skill based: "That skill base is, in my opinion, just a bunch of baloney. To get a card is not skill base. I know people say it is skill based, but it's just so they can categorize it in a certain segment"
On the argument that online gaming would bring in revenue to some states that desperately need it: "You could also make that argument for legalizing heroin and cocaine and prostitution. You can create a lot of sin tax for the government to make money." On his opinions of Governor Christie instituting online gaming In New Jersey: "I don't reward or punish politicians. It's not my job. I'm only one vote, but that of my family. I do support a lot of politicians, but I do so because of their ideology and their sharing of values with me... I am not trying to be a dictator. I'm trying to live my live as a normal person." "They are not getting wrong. I just had lunch with Steve Wynn. He is not totally against what I am saying. He discussed with me on his the potential impact on his property and my property in Las Vegas because we have two different markets. It really will not affect us one way or the other. I bring this up not because it is a business issue, but because I am citizen of the United States, a veteran of the Korean War, a father, a grandfather I am a patriot and I care about this country... I am not going to stand by knowing what I know, experienced what I experienced and not speak out. We did an eight country survey in Europe because we are contemplating doing a major development there and we found that the eight country that allow full internet gambling has gone up an average of 28% when the land-based casinos have gone down from 3-6% or stayed exactly even with a previously anticipated 5-10% growth factor. For 10 years, if you factor in 5-10% growth factor or even if you just stay even it is a great loss. I have 2 teenage boys. They get addicted to everything that is on the TV. When they talk about Gary Loveman only wants Poker. Gary Loveman and MGM have their own challenges. I do not have Challenges... We made billions of dollars last year. It is not a money issue with me. I think it is a train wreck. It's really toxicity. It is a cancer waiting to happen." "First of all, let me tell you that the casinos account for less than 10% of my total gross income and EBITDA. I do have my properties in Vegas at $350 Million EBITDA. I do it in one property. In Macau or Singapore. Singapore last year made five times what our property earns in the United States. We are not intending to get into it. I'm just telling you any skeptic could say that money is the consideration. Money is not a consideration. Money is not a consideration with me. If you just look at where I stand in Forbes rating, No. 15 in the world, making $200 million extra is not an incentive for me." "No. No. I don't want it. It is not $32 Billion in Europe. If you want, we had a study done from eight countries from one of the betting gaining researchers in the world. What do you do with a kid that is either underage or of age with student loans? It is very easy for them to get pressured by peers to go and gamble white they are drunk or doing drugs." "Of course it is...No land-based casino would somebody that's our of control of themselves to sit and gamble... Let's say one thing for sure, it's an adult who gets dressed, gets in the car, comes with friends, goes to a place, they have a bueffet, they play, they go bowling and they play for a couple of hours hours on the tables and they enjoy themselves as entertainment, this not dressing in your Birthday suit, taking your computer into bed, and it is not underage kids that get set up by of-age kids, and they play until they lose all of their money. I believe that poker and other forms of gambling, poker particularly since it's considered a social activity and not gambling per se, kids will get up in the middle of the night if they cannot sleep, or they come home late, and they challenge each other to say, let's play some power or some blackjack. They are going to lose." "That skill base is, in my opinion, just a bunch of baloney. To get a card is not skill base. I know people say it is skill based, but it's just so they can categorize it in a certain segment." "Absolutely not. Look, I'm a father, grandfather. I do not want my children - I'm a veteran of the Korean War. I do not want my children to have the opportunity to become addicted to gaming. And poker, in my opinion, would become one of the most addictive games. People do not get addicted to necessarily playing blackjack. They get addicted for the game. It is one of the many compulsive behaviors and somebody is addicted to gaming, they are addicted to some other compulsive behaviors. Can you tell me one good reason why internet gaming should be allowed." "You could also make that argument for legalizing heroin and cocaine and prostitution. You can create a lot of sin tax for the government to make money." "Well, why don't we say that other sins, crime, mugging, thievery, well kind of make that mobile too simply because everything is mobile? And what makes Jeff Bezos and Eric Schmidt a lot smarter. I've got 68 years of being in businesses. I've created over 50 businesses and never failed in one. I have recreated the hotel and gaming industry worldwide with a concept of integrated resources. I do not need any more money. Being the 15th richest man in the world does not make incentive to make a couple hundred million dollars more. "I live Governor Christie. I talk to him. He said he was about to be overridden anyway. He said it was about to be overridden or over-vetoed or whatever you call it. I like Governor Christie, but I'm not making any commitments. I like other candidates as well." "I don't reward or punish politicians. It's not my job. I'm only one vote, but that of my family. I do support a lot of politicians, but I do so because of their ideology and their sharing of values with me... I am not trying to be a dictator. I'm trying to live my live as a normal person. I can speak up because I'm an expert on the subject. The largest gaming and hospitality company in the world. I want to sound boastful, but we earned more money than the top three or four hotel companies combined. We have accomplished an awful lot. I have talked to some politicians about it and they agree with me. It's the first time in history of their office that a citizen has come in and said, please don't pass a law that will make more money for me." "People are surprised by a lot of thing I do or don't do." "I stand on moral principle. This is a moral issue for me. Morality as described in Webster's dictionary is to do the right thing, that is not doing the right thing. It is doing the wrong thing."